Farkle might be the most recognizable of the few games I’ve covered since it’s been around for a little over two decades per Wikipedia, yet I was entirely unaware of the existence of this dice game involving luck and risk until this year when I began researching and collecting board and card games. 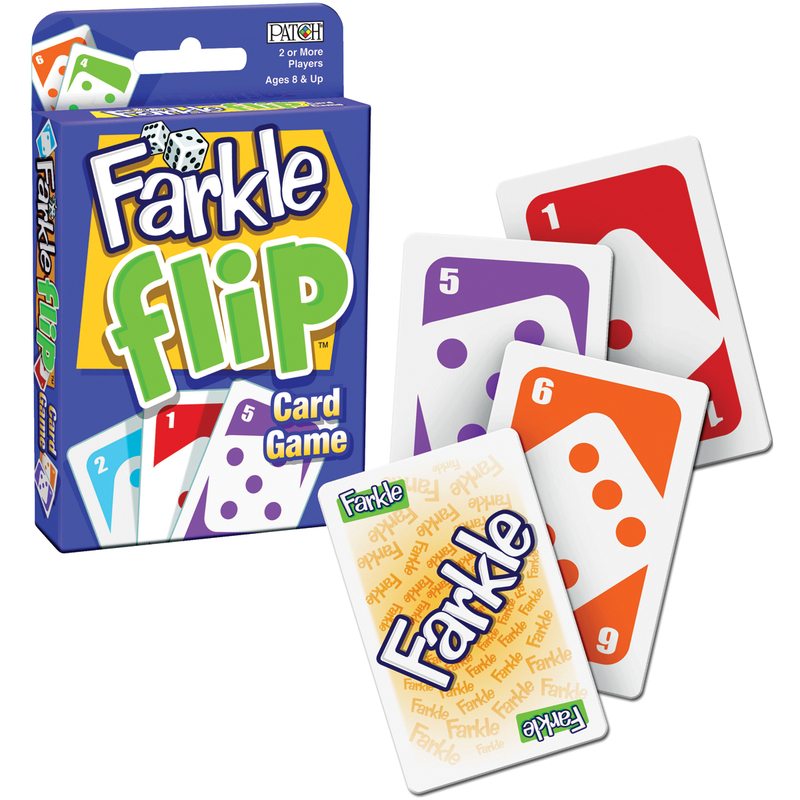 Unlike a typical board game, there are many variations on the basic game of Farkle which can be stripped down to its basic no frills dice version or perhaps something like Spicy Farkel and Farkle Flip, the card game. I’m going to cover the ones that I’ve played and highlight the various sets available so hopefully you can decide which version works best or if perhaps you’d like to add a bit of every flavor. The rules of Farkle are not necessarily set in stone but the basic goal is to be the first player to score 10,000 points. You can choose to reduce this to 5,000 for a shorter game or any points however you see fit but 10,000 is the standard. Farkel Party with cups and corresponding dice. All you need to get started with Farkle is a set of six standard numbered dice and a way to keep score. The longest part is perhaps writing down each player’s name. This is the no frills version or you can always shell out for something that offers a little more. 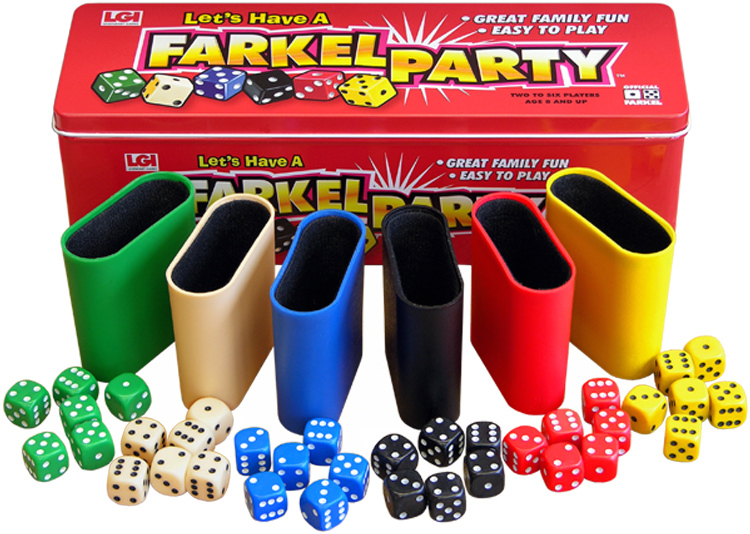 I purchased a set called “Farkel Party” (the reasons as to why some of these go by “Farkel” instead of “Farkle” remain a mystery to me) which comes with six dice cups in various colors, each with their own corresponding set of dice plus a scoring pad. While it may be fancier, the time it takes to get up and running is still just as minimal. Players roll six dice in an effort to score combinations that grant big points. During your turn you must keep at least one or more dice each time you roll, which could potentially increase your score. In order to keep scoring you must roll a one or a five at the very minimum, assuming you haven’t rolled one of the combinations which could for example consist of three pairs, a straight set of one through six, four of a kind, two triples, etc. Each time you roll you’ll be removing at least one of the dice in order to roll again. 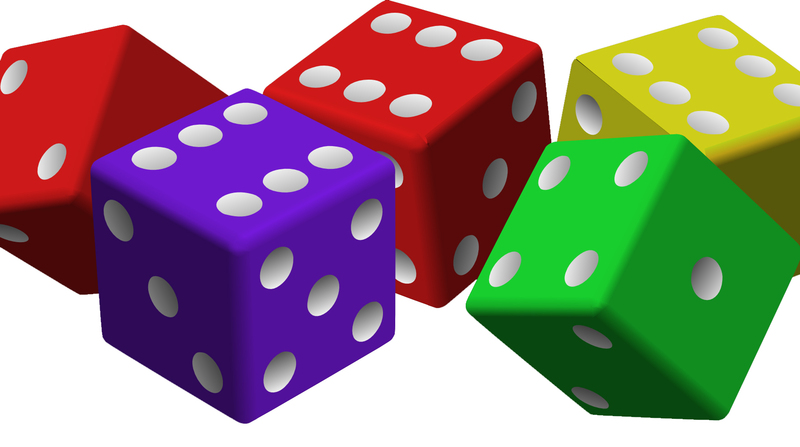 You may on the other hand score with all six dice on one roll which is often referred to as having “hot dice”. In this case you have the choice to roll all six dice once again and add to whatever existing score you may already have. Regardless of whether or not you have hot dice, failing to roll at least a one or a five will cause you to lose everything you may have accumulated. That’s right; that combination of two triples that earned you 2,500 points mean absolutely nothing if you decided to take your chances by rolling again and failing to score. Before you can begin making any points that actually count however, you must get “in” to the game by making a minimum starting score. This can also vary but the general minimum seems to be 500 points. While there are the standard rules of Farkle, the game is open enough that you can choose to modify some of these rules to fit your current gaming session or make things a little more competitive. Besides making the scores higher or lower, there are variations where if you manage to farkle for three straight turns you receive a 1,000 point penalty. Some of the other versions of Farkle that are sold already take this into account, starting with Spicy Farkel. 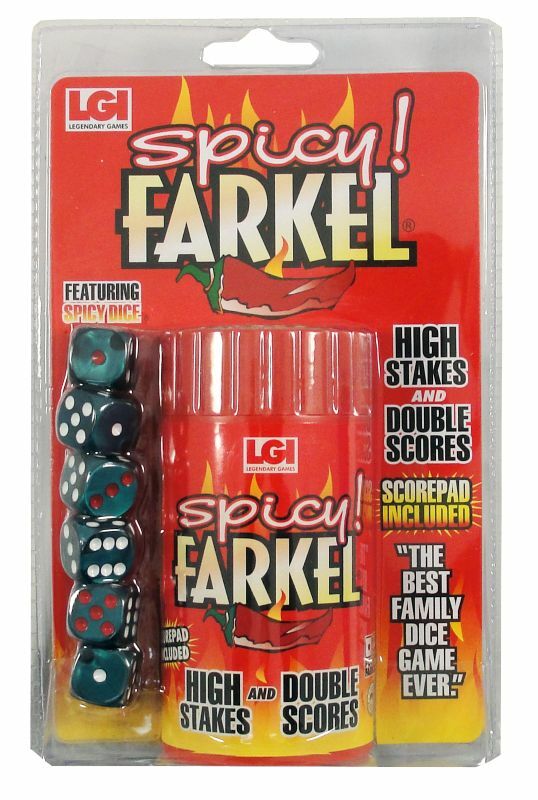 Spicy Farkel in its original packaging. Everything fis inside the cup. Spicy Farkel keeps the same basic foundations of the original Farkle but each die has one red side which will double your score. Instead of ones and fives being worth 100 or fifty points, these will count as 200 and 100 points respectively as long as they are red. With Spicy Farkel your goal is to reach 25,000 points but again, this number can be modified if you’d prefer a shorter game. While that may seem large you can potentially make some massive scores if you happen to roll scoring combinations with the spicy die or if you’re lucky enough to roll those aforementioned hot dice. In fact, if you somehow manage the rare feat of rolling all six spicy die on a single roll you automatically win the game. While Spicy Farkel seems like a slight modification of the base game, there is a hugely differentiating element that can quickly sway the tides of the game. If a player chooses to bank their score and still have dice left over that they decided not to throw, the next player can choose to throw those dice. If they manage to score with those remaining die, the player not only gets whatever score they made with those dice but also receive the score that their opponent decided to bank. If the player doesn’t score with any of those dice they farkle and their next turn is over even before it officially began. Farkle Flip; Dice in the form of cards. Farkle Flip is arguably the most different variation of Farkle. While the goal remains to score 10,000 points, how you go about it is completely different. Each player receives one card, displaying a number and the corresponding die which is placed face up, visible to all other players. All of the remaining cards are placed in a draw pile. During your turn you’ll be drawing cards which you can then add to any player’s deck, these cards do not belong to you. You can take cards from any player’s deck and move them to another deck in order to make the same scoring combinations that you would If you were playing a standard game of Farkle. You can continue to draw cards from the deck until you decide to stop or you draw a Farkle card. In Farkle Flip, the dreaded farkle doesn’t necessarily carry the same bad reputation it’s got when dice are involved. While it will still end your turn, it can actually work to your advantage when it comes to banking your cards. Should you farkle, you actually keep this card and put it aside until you decide to bank. Banking in Farkle Flip works similarly as if you were playing with dice. You can stop drawing cards and bank the scores you may have achieved but the similarities stop there. Should you draw a Farkle card, you lose any cards you may have banked before ending your turn and therefore do not score but they remain in the game and can be used by another player if they add to it. In other words, your opponent can’t just bank whatever cards/combinations you may have put aside and “steal” your score. Remember those Farkle cards you put aside? If you have Farkle cards each of these will add 100 points to your score so unlike the dice game, they do have some small benefits. 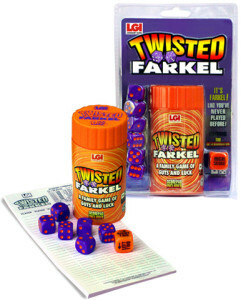 You lose if you score in Twisted Farkel. Twisted Farkel is perhaps the most refreshing interpretation of the game involving dice. In this iteration, you’re trying not to make 10,000 points and if you do well, you lose. In order to get “in” the game in this version all you need to do is throw the highest number to determine who goes first but this will also mean that you start with the highest score which is something you don’t want. From there you’re applying the same rules and gameplay as if you were playing standard Farkle (e.g. : putting aside ones and fives, grabbing combinations). After these standard steps are taken, everything changes. Once you decide to stop rolling, you keep the score but as to who actually “earns” the score is determined by the die with the awesome name of the “determinator die” which you must throw to end your turn unless you farkle (more on that in a bit). This die contains sides that say things like High Score, Left Two, Right One, High Score, Low Score, etc. Whichever side the die lands on will determine who actually gets the points you just earned so if for example the die landed on left two, the second player to your left would end up with the score. High score would obviously mean that the player with the highest score at that point in the game would get the points which only makes a bad situation even worse, especially if you happen to be that player. An interesting twist to this is if two players currently have the same score and the determinator die also happens to land on high or low score, it’s up to the player’s whose turn it is to determine who will end up with those points. In scenarios where someone may have managed to roll a score of 2,500, this can be absolutely devastating. The determinator die does not rear its ugly head if a player farkles. Unlike in the other versions, not only does a farkle end the player’s turn, he or she also receives a 500 point penalty. Again, you don’t want to earn points in Twisted Farkel. Farkle – If you’ve never played the game, start here. If you like the idea of gambling without actually having to spend money or chips*, you may enjoy the unpredictability of the original Farkle. It’s very easy to learn and can be easily played by people of nearly all ages. 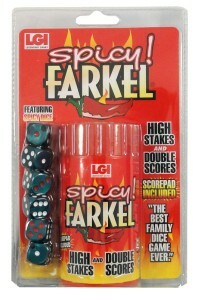 Spicy Farkel – Spicy Farkel adds just enough variation to make it worth having alongside the original Farkle. The plastic cup that everything comes in also doubles as a padded dice cup which is nice, albeit very noisy. The portability also makes it convenient for carrying it in your pocket or purse if you’re visiting someone and or just want to have it around for an impromptu game to pass the time. However, the gameplay mechanics in this version differ the least when compared to the original so that’s also something worth considering. Farkle Flip – If you like the idea of Farkle and want to try a version with a better degree of control, go with Farkle Flip. This one allows for greater amounts of strategy yet it retains the same risks of the original Farkle, even if the penalties may not be as severe. Plus, it might appeal to people who are into card games. Twisted Farkel – In terms of all out fun and just laughing at the results, Twisted Farkel is a fantastic game to play with groups. It also maintains the foundations of Farkle but presents it in a…well, twisted way that makes it just as unpredictable but with greater penalties on players. That may or may not be a good thing depending on who you’re playing with. I managed to be the victim of several rolls of the determinator die which was frustrating yet absolutely hilarious. If you’re playing with children, they on the other hand might find this just plain unfair. Still, there is something devilishly fun about intentionally making a giant score and then bestowing it upon a player with the lowest score. * Farkle Blitz and Farkle Live are a pair of smartphone games that use the original game rules but do in fact allow you to bet chips and thus gamble. Great review. Keep them coming.